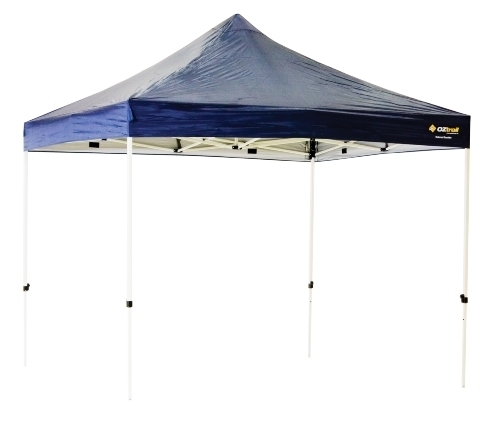 Tentworld: OZtrail Deluxe Gazebo at the markets, and sports events. OZtrail Deluxe Gazebo at the markets, and sports events. If you've been to the markets lately, you would have noticed that they're swamped in OZtrail Gazebos. Mostly OZtrail Deluxe 3x3 Gazebos. The very popular Oztrail Deluxe 3x3 Gazebo. There is a good reason for this. They're made from strong materials, they're repairable and they have a wide range of gazebo accessories and different styles of walls available too enabling you to customise your setup to suit your needs. The OZtrail Deluxe 3x3 weighs 27kgs and when packed away measures 160x35x30cm so it is definitely no small object. OZtrail fortunately have tackled that problem head on and included with the Deluxe 3x3 gazebo a wheeled carry bag. Allowing a single person to move the Deluxe 3x3 with ease. Setting the Deluxe 3x3 Gazebo is easy enough on your own, but to make it easier it does help to have a friend. The best way to do it is to open the frame up 3/4 of the way, then throw your canopy over the to and place in its correct position. Once you've done this, extend out your Deluxe 3x3 until it's locked into position. You can now locate the gazebo in its final position. Hammer pegs through the legs, and extend the gazebo to the height you desire. Be sure to use the guy ropes attached the fly incase a large gust of wind comes through, these can pick up the gazebo if they're not adequately secured as if it was an umbrella! It can be very scary. If you're looking for a Gazebo to take camping, I would recommend you consider the Oztrail Standard Gazebo. The OZtrail Standard Gazebo is the perfect choice for the camper. Dont be deceived by its name, this gazebo is in my opinion the perfect choice for camping. It weighs less than the Deluxe 3x3 at 20kgs, is 135x22x25cm vs 160x35x30cm making this gazebo much easier to handle, store and lift if necessary. Especially important if you're planning on storing your gazebo on the roof of your car! The frame design on the Oztrail Standard Gazebo operates differently to the Deluxe Gazebo. Instead of having a pole that extends from the centre to the peak the poles extend from each corner to the peak. This design means that the gazebo is less prone to pooling water in a heavy down pour. Best of all though, the OZtrail Standard Gazebo is compatible with all of the OZtrail Deluxe accessories such as the tent inner kit (converts your gazebo into a tent), screen house inner kit (converts your gazebo to a screen house! ), screen walls, solid walls, walls with zips etc. Setting up the OZtrail Standard Gazebo is the same process as the Deluxe Gazebo. Best practise for it, and the Deluxe Gazebo is to remove the canopy when you pack it away. Failure to do so may mean that the frame may pinch the material, not a good move for keeping a water proof gazebo! Click these links for more information about the Oztrail Deluxe 3x3 Gazebo and the OZtrail Standard Gazebo.